are updated to last versions of those maps. 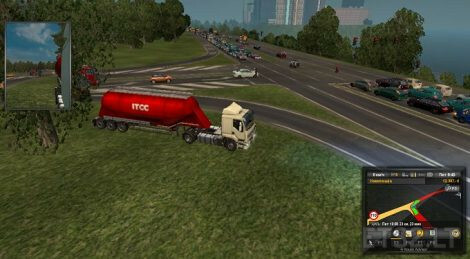 Better traffic flow for Rusmap is in Realistic Russian highways. – I added semaphores on all crossroads where are at least 2 entrances with 2 lanes. I didn’t do it on some crossroads in cities, between two crossroads with semaphores. I am sorry for traffic lights in air, adding poles takes too much time. For me, the most important is that semaphores are working. As some of SCS’ crossroads (highway at-grade crossroads) don’t have semaphores, use ASSETS if you want them; if you don’t use ASSETS with Promods, Dutch map and Southern region. WARNING!!! If you use ASSETS with Promods, Dutch map or Southern region, game will crash. – I replaced most of one-lane interchanges with two-lanes of same type. Main link will lead you to page where you can choose files which you want to download, ask any question, report bug/crash and follow my work. There are all my mods.